So I figured it was time to paint them up so they can help with the war effort. 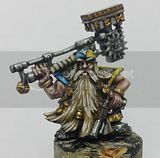 This chap was painted close to the GW scheme as I really quite liked it. I didn't like the bold green for the astropath so I went with a more muted turquoise. And the chap who is most likely to see service with my boys got the khaki drab that is my goto base uniform colour for my guard army. Painted to a tabletop standard and painted quite quickly these were a welcome break from trying to up my skills with the more complex models I've been trying of late. – a lesson learned I think and I'll try and keep the table populated with both tabletop and more challenging jobs at the same time. They need names. Or at least, your Coy Cdr needs to give them nicknames. And really like the turquoise. Hmm. I shall have to give some thought to naming. in fact, unlike many of my esteemed colleagues, I have yet to name any of my IG guys, except in passing during play. none have yet "stuck"
Nice job on these, good color choice for the astropath. These are awesome! Thanks for sharing, can I ask how you painted the Khaki on the MOO? I really like the effect, I was looking on other posts but can't find a guide, thanks in advance. There is a post on Khaki coming soon as I'm trying to decide something :) but the short answer is that its Vallejo Model colour Iraqi sand, highlighted with Iraqi sand mixed with white, then given a controlled series of washes with dilute army painter strong tone to apply the shading. Very characterful pieces, great work.